The Real-time Transport Protocol (or RTP) defines a standardized packet format for delivering audio and video over the Internet. While protocols like SIP or H.323 are used to control the call (e.g. setting up a connection, dialing, disconnecting, etc. ), RTP is used for reliable transmission of data packets and maintaining Quality of Service. In other words, RTP streams carry the actual voice payload encoded utilizing one of a number of codecs, and analysis of RTP data provided invaluable information for assessing call quality and troubleshooting VoIP networks. 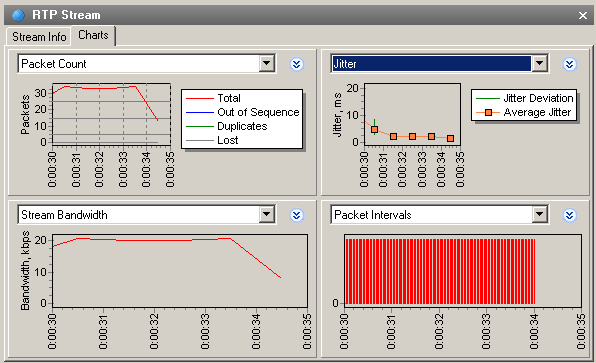 Packet Count – number of RTP packets per second including duplicates, lost packets, and "out of order" packets. Stream Bandwidth – stream speed in terms of kilobits per second. Packet Sizes – average sizes of RTP packets broken down by network and RTP headers, and RTP payload. R-Factor, MOS Score – stream quality estimation. Packet Intervals – temporal allocation of RTP packets in a stream. 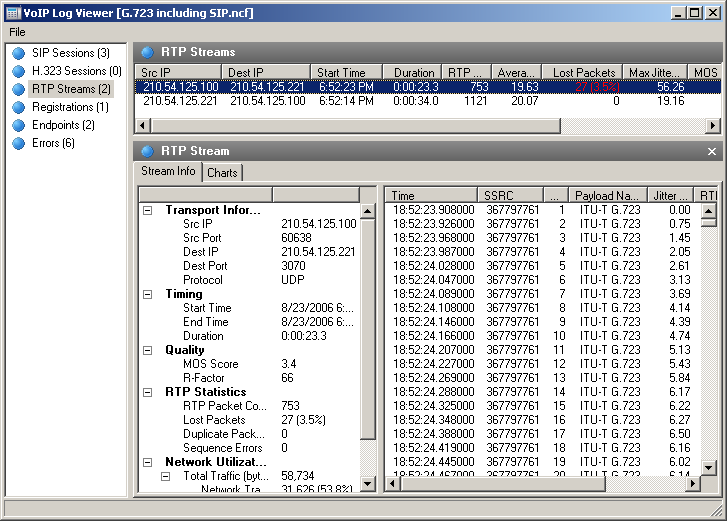 The RTP Streams list contains all captured RTP streams, both belonging to SIP or H.232 signaling sessions, and the ones for which signaling sessions were not identified (so called 'orphan' streams, i.e. the ones that don't belong to any parent session). Please refer to the Settings chapter for more detailed information on how to exclude RTP streams that don't have corresponding signaling sessions.